Director – Jean-François Richet, Screenplay – James DeMonaco, Based on the 1976 Film Written by John Carpenter, Producers – Pascal Cauchateaux, Jeffrey Silver & Stephane Sperry, Photography – Robert Ganz, Music – Graeme Revell, Music Supervisor – John Houlihan, Visual Effects Supervisor – Dennis Berardi, Digital Visual Effects – Mr. X Inc (Supervisor – Kristy Blackwell), Physical Effects – Acme FX (Supervisor – John MacGillivray), Production Design – Paul Denham Austerberry. Production Company – Why Not Productions/Liaison Films/Biscayne Productions. New Year’s Eve, 2004. Sergeant Jake Roenick is in charge of a Detroit police precinct on the last night before the station is due to be closed. Roenick is also being analysed by psychologist Alex Sabian concerning the lingering guilt he feels over his involvement in an undercover operation that went wrong, ending with two officers dead. Meanwhile, underworld kingpin Marion Bishop is arrested after killing a cop and agrees to turn state’s evidence. He is taken away to a holding facility. However, with blizzard conditions closing in, the prison transfer bus is forced to stop at the precinct and place Bishop and three other arrestees in the cell overnight. Snipers circle the precinct and burst in, trying to kill Bishop and shooting the two transfer officers before being driven back. After killing one of the snipers, Roenick realises that they are not Bishop’s men but police officers. In turning evidence, Bishop could bring down more than 30 dirty cops and they have come to eliminate him and prevent him from speaking out. Realising that the police are intending to eliminate all of them as witnesses, Roenick, the retiring officer Jasper O’Shea, secretary Iris Ferry and a stranded Alex are forced into a tenuous truce with the four prisoners to fight for their survival. Assault on Precinct 13 (1976) was John Carpenter’s second film and has proven a modest cult classic. This new version of Assault on Precinct 13 came out as part of a series of remakes of 1970s horror films that have become the in-thing in thre mid-00s. These have also included the likes of The Texas Chainsaw Massacre (2003), Toolbox Murders (2003), Dawn of the Dead (2004), The Amityville Horror (2005), The Fog (2005), Black Christmas (2006), The Hills Have Eyes (2006), The Omen (2006), Sisters (2006), When a Stranger Calls (2006), The Wicker Man (2006), Halloween (2007), The Hitcher (2007), April Fool’s Day (2008), Day of the Dead (2008), It’s Alive (2008), Long Weekend (2008), Prom Night (2008), Friday the 13th (2009), The Last House on the Left (2009), My Bloody Valentine (2009), Night of the Demons (2009), Sorority Row (2009), The Stepfather (2009), And Soon the Darkness (2010), The Crazies (2010), I Spit on Your Grave (2010), Mother’s Day (2010), A Nightmare on Elm Street (2010), Piranha (2010), Don’t Be Afraid of the Dark (2011), Fright Night (2011), Straw Dogs (2011), The Thing (2011), Maniac (2012), Carrie (2013), Evil Dead (2013), Patrick (2013), Poltergeist (2015), Suspiria (2018), Child’s Play (2019) and Pet Sematary (2019). Assault on Precinct 13 1976 was a tension-bared siege film about a handful of people trapped in a police station fending off marauding gangs attacking outside. Assault on Precinct 13 2005, which comes with a script from James DeMonaco who would go on to write and direct The Purge (2013) and sequels, has updated the original in interesting ways. The most noticeable change is when it comes to the character of the father who triggers the assault off after shooting a gang member in retaliation for the murder of his daughter. There is no father or daughter, or even for that matter gang members, in the remake. Instead, the remake has focused the assault around the central character of the prisoner that the cops enter into a tenuous truce with, while the attacking street gangs have now been turned into corrupt cops seeking to prevent him from turning state’s evidence. This rewriting results in two films that are nominally similar in terms of the basic things that happen but have substantially different subtexts. Assault on Precinct 13 1976 was a film that never questioned too much whether the line that the officers in the precinct were defending was good, it was about the forces of civilisation defending themselves from the forces of urban lawlessness that were baying beyond their door. By contrast, Assault on Precinct 13 2005 had been made following the O.J. Simpson trial, post-Rodney King, post-Abu Ghraib, where it has become difficult to believe that the forces of law and order are unquestionably always on the side of good and where the film is now about a battle between a handful of people trying to fight the endemic corruption within their own ranks. The basics of the Assault on Precinct 13 1976, which was made on a low budget, have been expanded out. The amount of artillery wielded against the precinct has been upped, with the attackers brandishing grenades, Semtex, rocket launchers and coming equipped with Kevlar body armour. In fact, they come so well armed that it becomes a stretch of credibility to wonder how the precinct manages to remain un-assailed for so long – it would surely only take a few more grenades and rockets to have razed the whole place to the ground. In the original, John Carpenter created a poetry out of the image of bullets coming through the windows in every direction, shattering windows and tearing up the interior of the precinct house; the remake amusingly upgrades the image but has it be (slightly less effectively) rifle lasers probing through the windows. In Assault on Precinct 13 1976, John Carpenter deliberately kept the gangs faceless and devoid of personality or motivation; the remake gives them a face in the form of Gabriel Byrne’s captain but also manages to keep the attackers faceless, looking like invading aliens hidden behind their combat armour, rifle scopes and the probing red laser points of their guns. Assault on Precinct 13 2005 notably also expands the original out in terms of its characters. 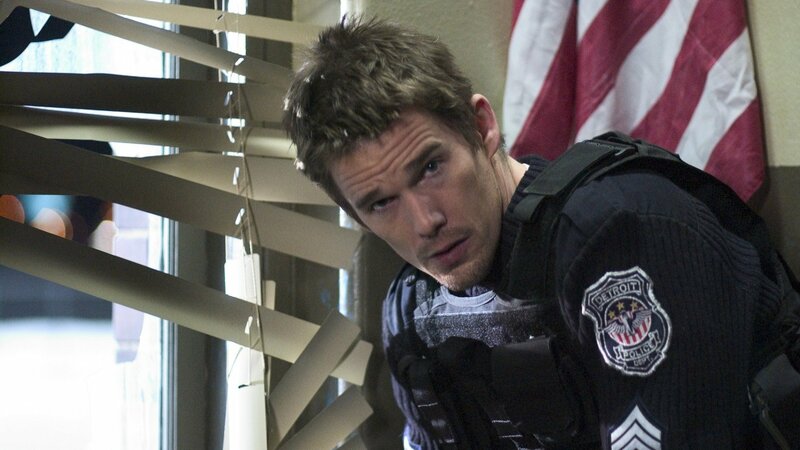 In a piece of motivational backstory, we are given an extended opening scene showing Ethan Hawke in the midst of an undercover drug operation that goes wrong and later see him being emotionally haunted by the incident. Many of the other characters have been expanded out, notably Brian Dennehy as an old school cop on the verge of retirement, who is present to confront Ethan Hawke’s moral stance, resenting the arming of the convicts and arguing for throwing Laurence Fisburne out to the figurative wolves. Less effective is the attempt to characterise Drea De Matteo’s secretary by putting her in fishnets and having her lusting after bad boys, which comes off as a one-dimensional caricature. The remake is certainly well cast. John Leguizamo, who is proving himself to be an increasingly underrated character actor with every film he does, has a highly amusing role as a wired junkie. The scene-stealer of the show proves to be Laurence Fishburne. Fishburne has never seemed more in control of a performance than he does here. While the equivalent character in the original film seemed more like the standard anti-hero who operates according to his own inner moral code as patented by Clint Eastwood, Laurence Fishburne radiates the lethal presence of a caged tiger and seems more than capable of being the dangerous criminal he is described as being. Assault on Precinct 13 2005 emerges as a fair-to-quite-good remake. The changes it rings up on the original are certainly interesting, while French director Jean-François Richet does an acceptable job of maintaining tension. In the end though, Assault on Precinct 13 2005 seems to fall in the shadow of its original. Maybe it is simply that Jean-François Richet is making his film after the original has been appropriated too much by the action movie genre – certainly, parts where he tries to expand it out, like the climactic scenes in the woods at the end, play too much by action movie clichés. More importantly, the remake lacks the original’s tough edge. While there are some shock despatches of characters here, there is nothing as jolting as the scene in the original where the little girl is shot, nor anything that builds to the intensity of the climax of the original with the survivors trying to defend against their attackers from behind a burning barricade. (Nominee for Best Supporting Actor (Laurence Fishburne) and Best Supporting Actress (Maria Bello) at this site’s Best of 2005 Awards).